We are Phuong & Myke. When we were both working full-time, we took many mini trips but hoped to one day tour the world in one long adventure. We lived and worked in New York City, then moved to Brussels, Belgium for one year. In September, 2016, we relocated to Seattle and are super excited to explore the Pacific Northwest. We still take mini trips, many of them! During each trip, we love to eat a lot, drink plenty of beverages, walk with no specific agenda, explore random neighborhoods, and sometimes take naps. We like to see as much as we can of each place but never try to see it all. We’d rather fully enjoy every minute of our time than rushing around with an itinerary. We also love hanging out with local friends and meeting new friends. In this blog, we document our adventures to serve as guides to where to sleep, eat, drink, and sightsee. With each destination, we will also give you a glimpse of local artists we love as music plays a big part in our life. Our first date was at Le Club Jazz in Kyoto’s Sanjo neighborhood. After a great night of pasta and Moscow Mules, Phuong ripped in half a ¥10,000 ($100) bill when Myke offered to cover the tab. (It was an accident, she said.) The first of many cute squabbles. Accepting defeat but also showing his resourcefulness, he later taped the bill back together and used it at McDonald’s. All was well with the world. The next few months consisted of weekly Thursday Jazz club dates all over Kansai, meeting new friends from all over the world, impromptu French and Vietnamese lessons, exploring Japan on many little adventures, taking long walks/naps, and studying…sometimes. Four years later the adventures have continued. We spent the following summer together in Washington D.C., graduated from college, lived in New York City, obtained master’s degrees in Brussels, and currently reside in Seattle. Our love has taken us all over the world, visiting several countries and dozens of great cities. We have been truly moved by all the friends we have met and experiences we have shared. We spent New Years 2013 in Vietnam. Visiting Phuong’s hometown of Ho Chi Minh City and traveling to a few cities in this beautiful country full of history. 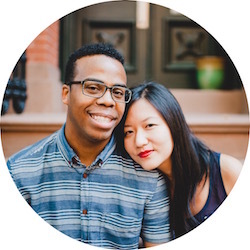 After a whirlwind of great food, memories and emotions, Myke proposed to Phuong in her childhood home. We got married in September 2013. Together we will continue to learn, grow, change, and live.